New Development !!! Brand New Full Title House in a Secure Security Estate. It is a Free Standing, Beautifully Designed and Good Quality Finishes. 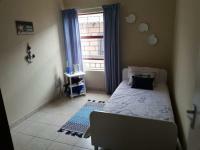 This Unit have 3 Bedrooms, And The Main with an En suite All have Built In Cupboards. A Stylish Kitchen with Granite Tops, A Lounge and a Beautiful Bathroom .1 Garage and with a Carpot and Garden Included. We will e-mail you when another property of this kind becomes available in Kosmosdal.